Istanbul. The name itself conjures up exotic imagery and a deep sense of history. Deservedly so, as it has been a capital city of three successive empires and can boast over 2,000 years of history. In addition, its location on two continents, the crossroads between Europe and Asia, provides a stunning and culturally diverse backdrop to the world's 7th largest city. It's no wonder that today Istanbul is one of the world's top tourist destinations. 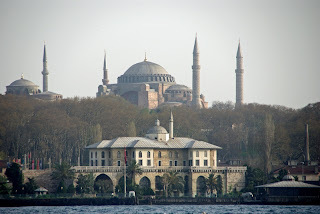 I was fortunate enough to spend a week in Istanbul earlier this year and despite my best efforts to see as much as humanly possible, I got the sense that I had barely scratched the surface. Most of the tourists I met planned to spend only two to three days in this marvelous city, a mistake of epic proportions in my books. Yet, in a way their hurry worked in my favour, as once I got away from the major tourist sights the crowds thinned considerably, allowing for an intimate look into the people and neighbourhoods of a truly remarkable city. 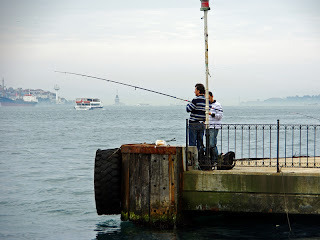 What follows is a look back at my week in Istanbul told through words and photographs. The photos are in small format to fit the proportions of my blog, but can be viewed in larger format simply by clicking on the individual picture. First things first: yes everyone in Istanbul (and all of Turkey for that matter) will try to sell you a carpet. And yes they have a special price just for you. "Hello My Friend, free to look!" ﻿﻿﻿﻿﻿﻿Don't be irritated or put-off. It's just the way it is. After a while you can't help but find it amusing. 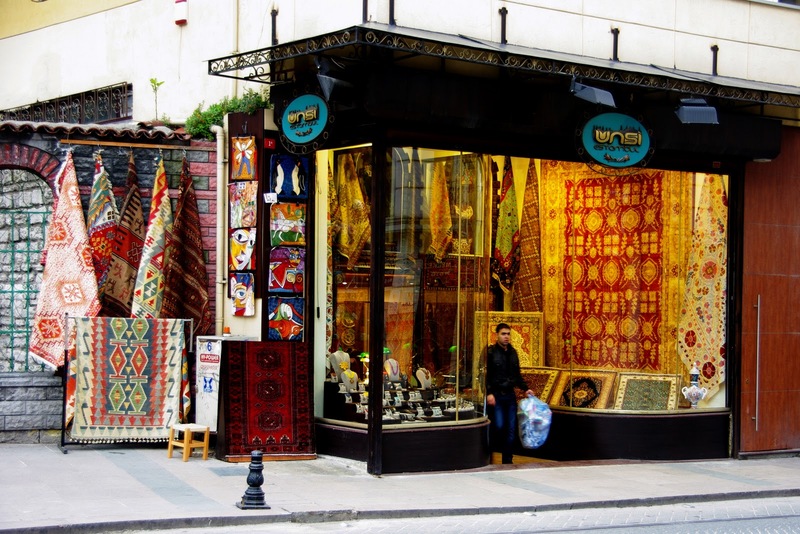 The three main tourist attractions in Istanbul are located a short walk from each other in the old town (Sultanahmet). Each is a marvel in its own right, and as a result is overrun with hoardes of tourists. Be prepared to be pushed aside by noisy school groups, stuck behind slow moving grandmothers on tour and hearded like cattle. Most people will try to see the big three in one day. To me that doesn't do them justice, simply because of the exhaustion brought on by fighting the crowds. In order to appreciate each place to the fullest, I opted to visit them one by one on different mornings when the crowds are smaller. Then, when I was about ready to rip the head off of some idiot sitting on a "please do not sit here" sign, I would head out to some less visited sight for a calming cocktail. If you plan to visit Istanbul and Hagia Sophia is not at the top of your "must see" list then you may as well rip up your ticket and go home. Not only is it stunningly beautiful, but Hagia Sophia is one of the most extraordinary buildings in the history of architecture. 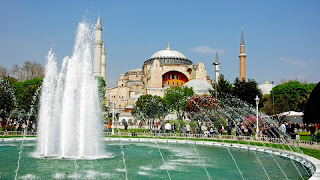 With its 56m high dome Hagia Sophia is the fourth largest cathedral in the world (after Saint Paul in London, Saint Peter in Rome and the Duomo in Milan). However, quite incredibly, it was built more than 1000 years before the others. 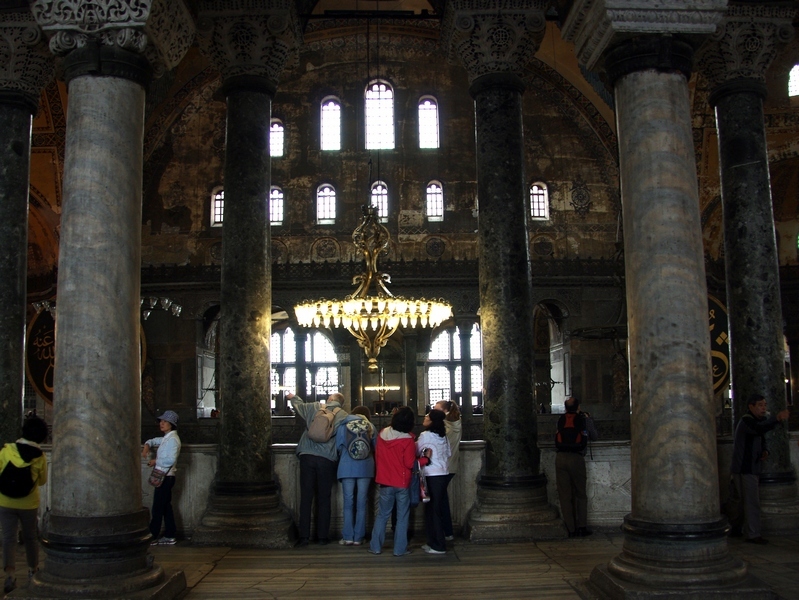 The current structure was built as a cathedral in 537 by Emperor Justinian. 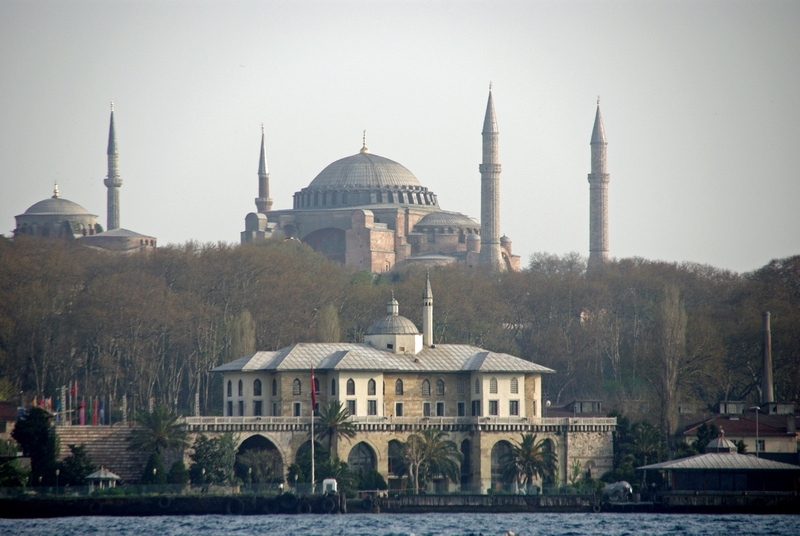 After the fall of Constantinople in 1453, Sultan Mehmed Conqueror turned it into a Mosque and built the four minarets at the outside corners of the building. The walls are adorned with two large circular plates where the names "Allah" and "Muhammed" are written in Arabic. 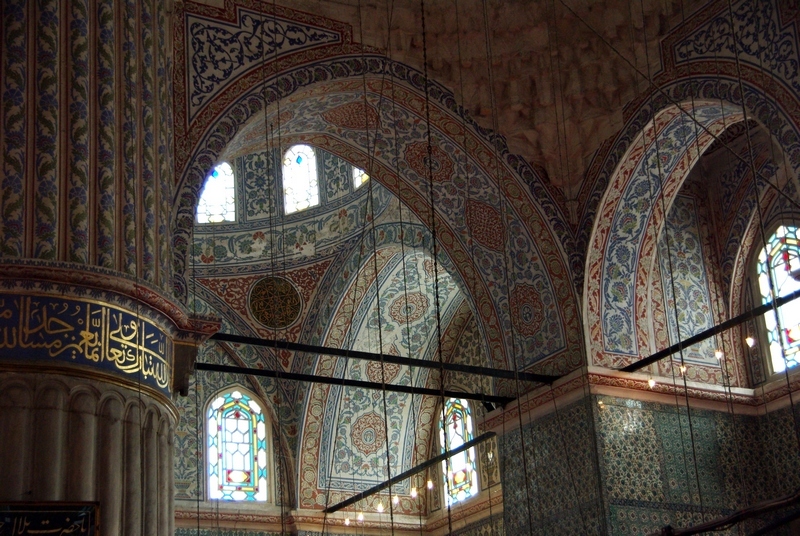 There are splendid Byzantine mosaics in a gallery on the second level. Visitors must pass through a security gate to enter the gallery where they are reminded not to use flash photography. As you near the mosaics there are large signs posted on the walls in every language imaginable prohibiting flash photography. 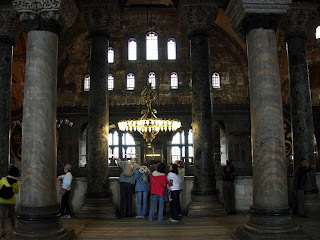 Yet, when I approached the mosaics I was almost blinded by the constant flashing coming from moronic tourist's cameras. It's so bad that a security guard is posted under the mosaics all day long doing nothing but yelling "No Flash! No Flash!". I was tempted to join him, adding the use of abundant expletives, but chose instead to leave the mindless masses behind and find a quiet cafe. 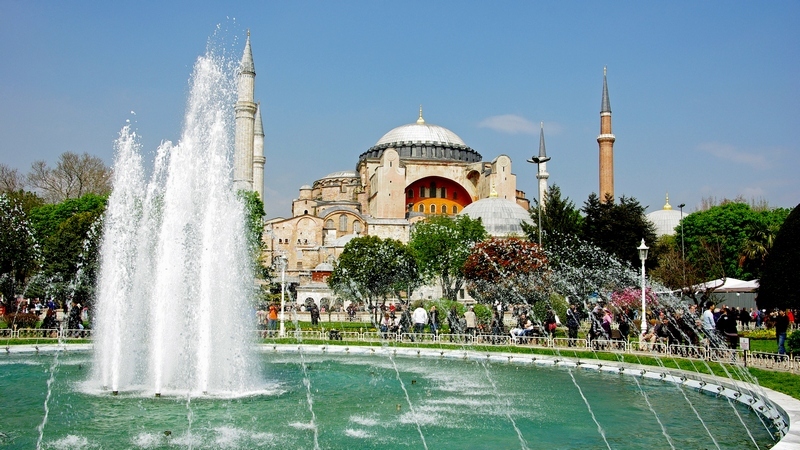 Located across Sultanahmet Square from Hagia Sophia is the beautiful Blue Mosque. It has an uncharacteristic 6 minarets. 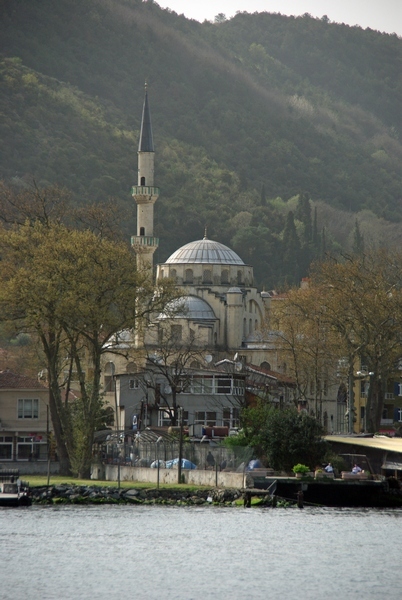 Legend has it that when the Sultan ordered its construction in the early 1600's, he asked for gold minarets. Apparently the Arabic word for gold is similar to the Arabic word for six, and the rest is comedic history. The Mosque's interior is adorned with intricate tiles, not surprisingly accented primarily by blue tones. It was designed with over 270 windows providing brilliant light to play off the many different angles in the building. 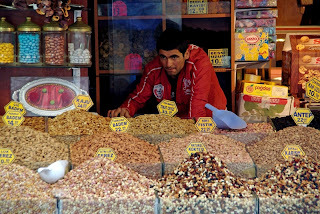 Despite the modern way of life exhibited in Istanbul outside the Mosque, I couldn't help but be struck by a stark contrast on the inside. It's not necessarily my place to comment, but I gotta say it, "C'mon guys, isn't it about time you let the women hang out with the men?" The last of the big three is by no means the least. Topkapi Palace was constructed soon after the fall of Constantinople and remained the residence of the Sultans until the mid 1800's. The palace is a sprawling complex as it used to house, in addition to the Sultan's residences, a hospital, bakery, arsenal, state mint, a part of the treasury and more. Give yourself plenty of time to wander around the entire site. I was particularly struck by the beautiful tile work in the Sultan's residences and the harem. It seems almost garish when viewed out of context, but in their place the designs are ornate and tasteful Have a look at some of the photos here and you just may find yourself transported back to a different time and place; when men were manly and women were "well kept". The highlight of the palace is unmistakably the harem, so much so that there's a separate entry fee just for it. 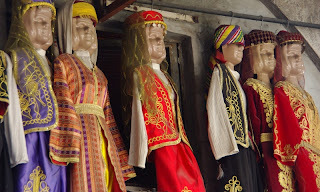 I found the very idea of a harem fascinating as I come from a part of the world where monogamy is, and always has been, the norm (unless you're a Mormon). So I took extra time to sit in the expansive harem courtyard, imagining what it would be like to stroll along gazing up at all the women who were hoping to be the one to catch my fancy that day. I decided that the Sultans were probably very tired most of the time. 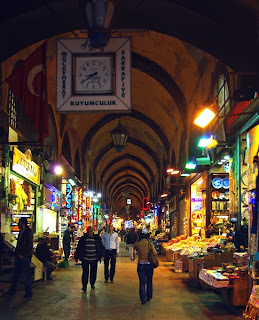 People love to shop, and in Istanbul it's no different, except that their version of the shopping mall is the Bazaar. 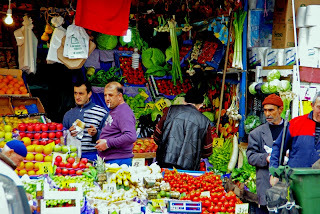 I found the Bazaars exotic fascinating slices of Turkish life. Mind you, to the average resident of Istanbul they are probably as rudimentary as Walmart and The Gap are to me. I wonder if there's a Turkish equivalent to the Mall Rat? This place is a marvel. 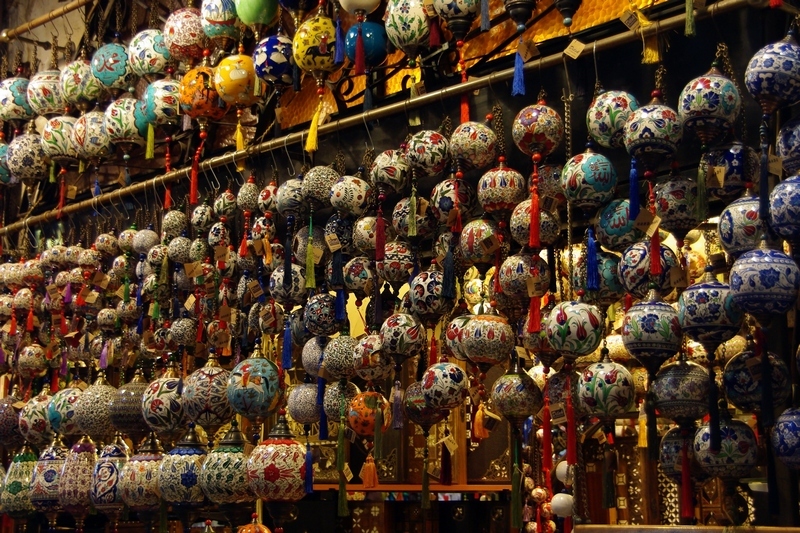 The Grand Bazaar is one of the the largest covered markets in the world, with 4400 shops in 64 streets and with 22 gates (entrances). It was started in the late 1400's and has grown outward in a rather haphazard manner, creating a labyrinth of corridors to confuse even the most experienced orienteer. The Grand Bazaar - let's shop! 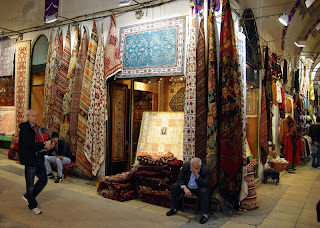 Needless to say, the most common items for sale in the Grand Bazaar are carpets, but you can find almost anything amongst these ancient corridors, as you can see in the following photos. 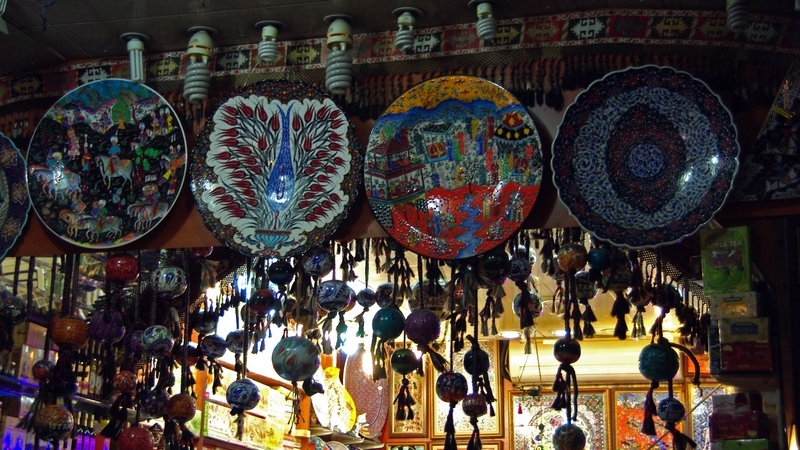 The Spice Bazaar is located adjacent to the harbour near the foot of the Galata Bridge. It's not as big as the Grand Bazaar, but is arguably more interesting as it is where a wide variety of food and spices are sold. It's most lively (and less crowded with tourists) first thing in the morning when the shops are being set up and the various items are being delivered. Prof. Dr. Suluk recommends leaches for all of your medicinal needs! When the Sultans left Topkapi Palace, they relocated to the more modern Dolmabahce Palace on the banks of the Bosphorus across the harbour from Sultanahmet. 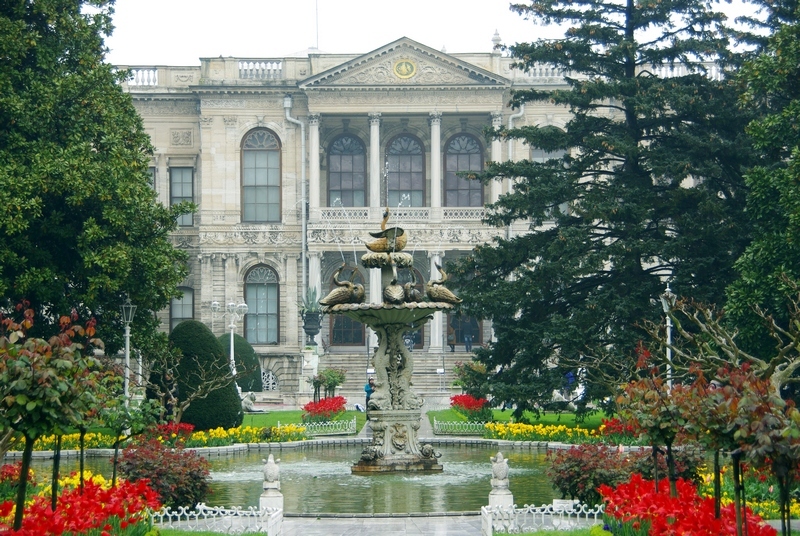 The style of the palace reflects European influences, the result of the Sultans (and Turkey) becoming more friendly with their neighbours to the west. 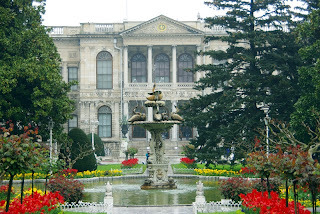 Probably the most notable influences are French, and the Dolmabahce is often referred to as the Versailles of the east. 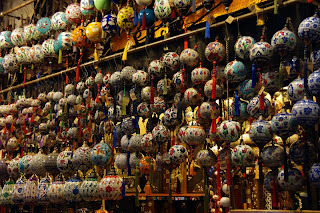 There are countless stunning rooms, ornately decorated and loaded with furniture and accessories from around the world. Visiting the palace can be a bit of an ordeal, however, as entrance is only granted via a guided tours. That, and they make you wear pink plastic booties over your shoes. So everyone bunches up at the main entrance until the tour in their particular language is called, at which time a stampede of plastic booty clad tourists pushes through a single turnstile and is quickly hearded from room to room. The complete tour is actually done in two parts so the whole scene is repeated a second time for the tour of the harem. Taking photos is strictly prohibited anywhere inside the palace, so all I can show you are some pictures of the grounds. Even so, not bad digs. 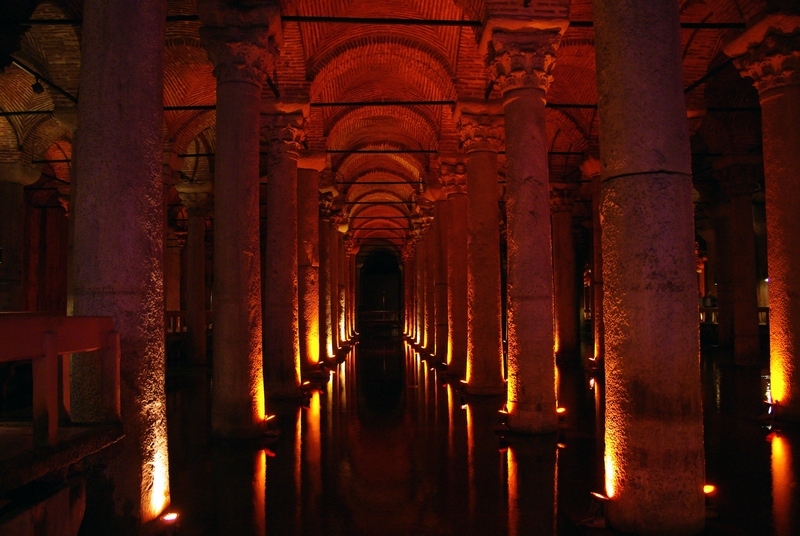 The Basilica Cistern was constructed in 532 as an underground water storage reservoir for the Great Palace and other buildings in Sultanahmet. 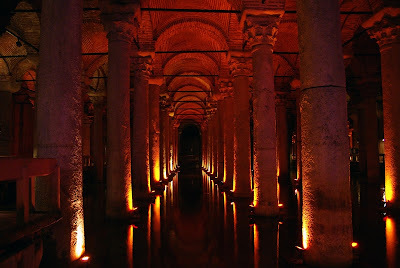 The dark and voluminous cistern is supported by 336 columns and is full of tourists taking flash photos that will inevitably not turn out. That was one well armed crowd control vehicle, complete with a large front end scoop for showing mobs who's the boss. I headed for Istiklal Street, the main shopping street that leads to Taksim Square, to get a better look and was confronted by one of the largest crowds I have ever seen. In addition to being a destination for leisure activities, Taksim Square has historically been the starting point or destination of many political demonstrations. May 1 marks the annual Labour Day demonstrations in Istanbul. It was during these demonstration in 1977 that unidentified gunmen opened fire and killed 36 demonstrators, an event since remembered as the Taksim Square massacre. All forms of group protests were banned in the square until 2010 when Labour Day demonstrations were permitted for the first time. 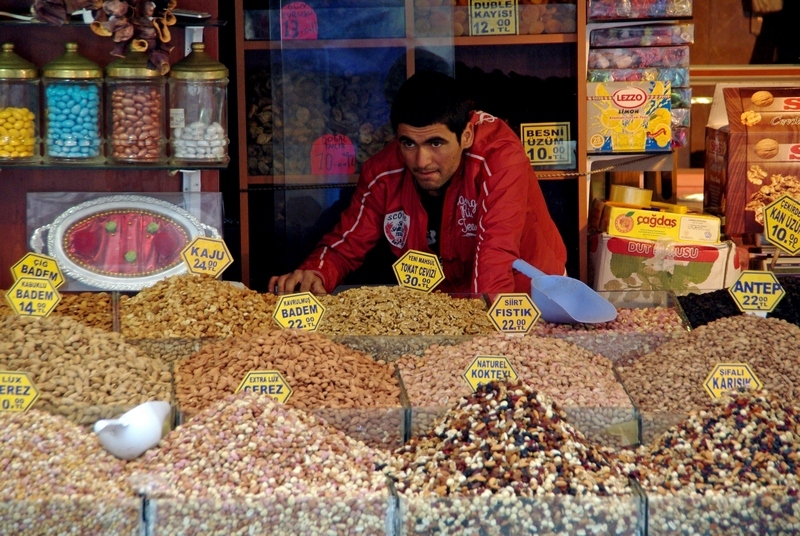 The peace was short lived, as a Kurdish suicide bomber killed himself and many others in the square on October 31, 2010. Needless to say, the May 1 Labour Day demonstrations of 2011 were heavily monitored and the police presence was extreme. I tried to keep a low profile. I returned to Taksim Square and the surrounding streets on a number of occasions. It's lively, fun and well worth exploring. In fact, despite the somewhat dark history (and the warnings on the US Consulate website), the Beyoglu district is where I will stay during my next visit to Istanbul. 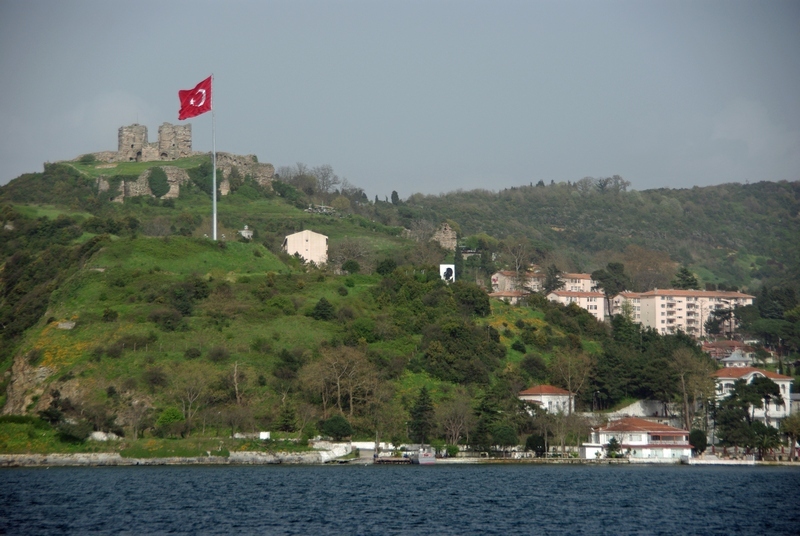 Located down the hill from Taksim Square and facing Sultanahmet is a fire lookout tower built in the 1300's. It wasn't until the 1960's that the amazing panoramic views from the Galata Tower were opened to the public. The view of Sultanahmet from the tower is unparalleled in Istanbul, providing a panoramic perspective of the Big Three attractions. 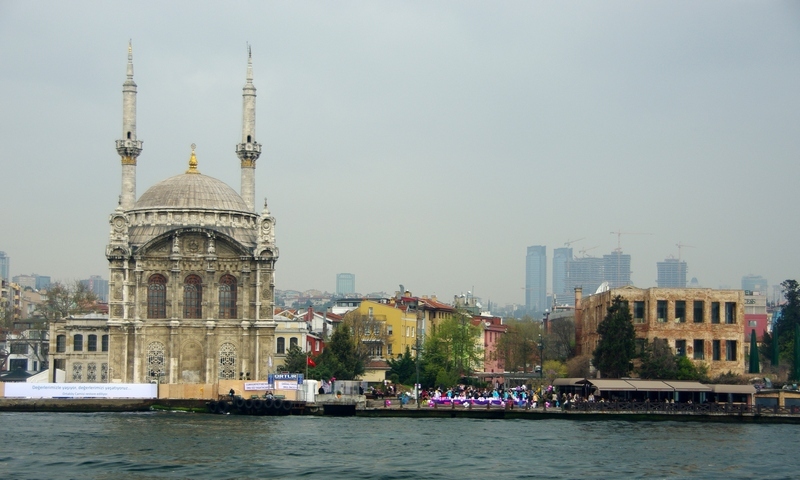 The Galata Tower provides an unobstructed view of the Bosphorus and Asian Istanbul on the other side. It also allows one to peek into the many rooftop terraces that are so popular in Beyoglu. No trip to Istanbul is complete without a boat trip on the Bosphorus. The Bosphorus Strait acts as the major artery of Istanbul; connecting the Sea of Marmara to the Black Sea, and Europe to Asia. It has been the region's major means of transportation for centuries, and despite the rather recent construction of huge bridges that span its width, the Bosphorus remains a hub for shipping and commuting. Many private companies offer tours and dinner cruises on the Bosphorus, but probably the most authentic boat trip is to ride a commuter ferry. The locals call it the "Beggar Ferry" because it makes so many stops along the way, all but begging for passengers at each one. The ferry I took was jammed, so I think they're doing a pretty good job. 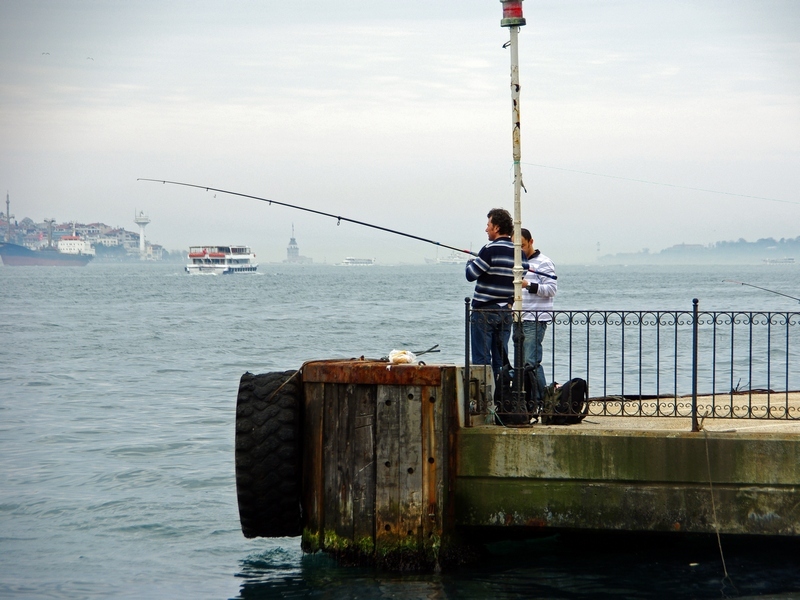 The most popular day trip is to begin at Eminonu (the ferry terminals along the Bosphorus in Sultanahmet) and take the ferry to Anadolu Kavagi, a charming fishing village on the Asian side of Istanbul near where the Bosphorus meets the Black Sea. The trip takes about an hour and a half as the ferry zig zags its way from one side of the Bosphorus to the other. Passengers are treated to some beautiful vistas while at the same time getting a sense of the immensity of Istanbul. Anadolu Kavagi is just as advertised; a small seaside village with a mass of restauranteers vying for your tourist dollars. And I thought the carpet salesmen were pushy! I waded through the touts and wandered up a hillside to the old fortress that used to stand guard over the entrance to the Bosphorus. My guide book suggested taking an hour or so to walk the ramparts, but at the front gate I was greeted by a padlock and a sign stating "Closed for Archaeological Purposes". Judging by the dilapidated state of the fortress and the rust on the lock (it had obviously not been opened for years), I'd say the sign could more appropriately have read "Closed because we can't be bothered with the upkeep". Still, I had noted an inviting restaurant on the hillside above the village, so I clambered back down and ate lunch overlooking the sparkling Bosphorus. I haven't enjoyed many better dining views than that anywhere. The village is apparently surrounded by military land, and except for a single access road, there is no other way in or out besides the ferry. Disappointed, I did what any sane traveller would do - I headed back to the village and found the cafe where the old men were gathered to gossip and play dominoes. I downed a few Efes (Turkish Beer) and soaked up the atmosphere. The best way to get to know any city is to wander through its neighbourhoods without any particular destination in mind. Some of my most memorable experiences occur when I'm doing just that. It often doesn't require a major effort to get away from a tourist destination. The side streets adjacent to a popular monument or building can often provide the little gems that make travel so much fun. Istanbul is full of such opportunities. 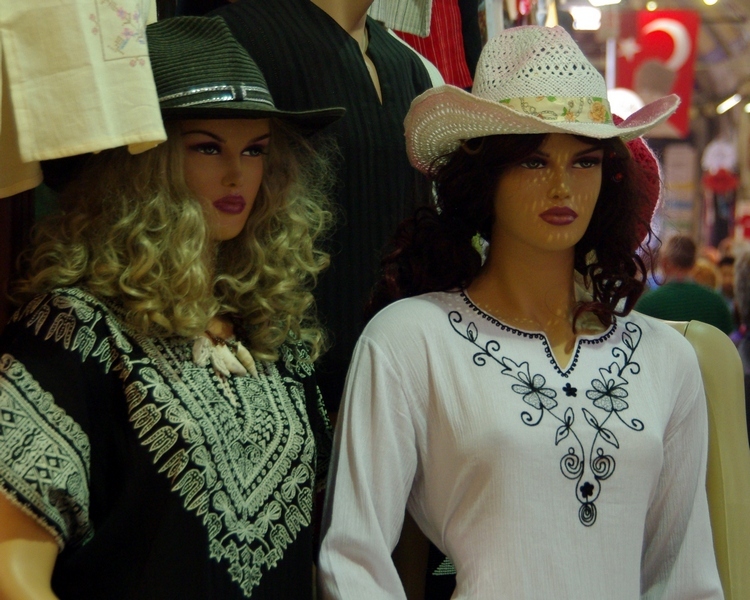 By taking some out of the way excursions I was exposed to some real aspects of day-to-day Life in Istanbul. Ok, you don't have to go out of your way to find these street vendors. They are everywhere! 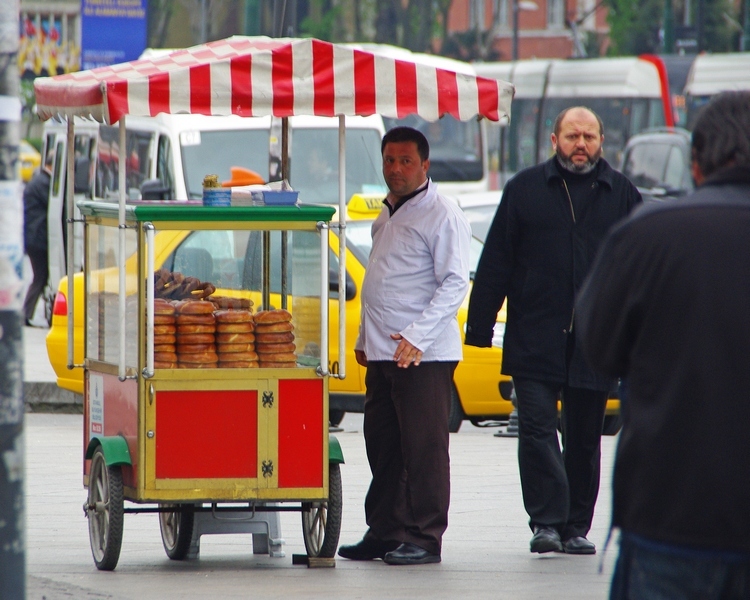 They are selling Simit, a crisp, ring-shaped, savory roll covered with sesame seeds. Turkish people love the stuff, especially when they wash it down with another Turkish favorite - ayran (salty liquid yoghurt). Doesn't anyone want to look at MY beads? Not all of the shopping is done in the bazaars. 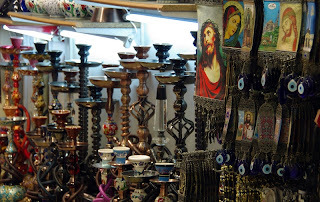 Poke your head behind a Mosque or down a side street and you often encounter one of these makeshift markets. Some of the markets seem more legit than others (I wouldn't buy an iPhone from one of these guys, but I might buy a leather wallet), yet they are inevitably populated by nothing but serious looking men. And of course there is the obligatory arm waving and yelling that as far as I can tell is really just to add atmosphere. Ok, so anyone who grew up in the 70's is familiar with spirograph. It was all the rage for kids before computers and video games came along to rot their brains. Actually, all it involved was spinning a plastic wheel around inside a plastic ring to make spacey designs, so I'm not sure which is worse. Regardless, it was for kids and the novelty wore off in about 5 minutes. Spirograph? Are you kidding me? So why are there grown men on every street corner in Istanbul selling spirographs like it's the next big thing? I kid you not. 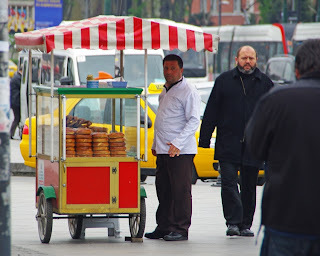 They were almost as prevalent as the guys selling Simit. I asked around and to this day have not heard a plausible explanation. I wouldn't eat anything that came out of that water (at least knowingly - I did eat a lot of street food). Because even the Turks get hemorrhoids - (Pfizer makes preparation H). But seriously, I was struck by the close proximity of an emblem that I associate with corporate America to the Turkish flag. Does this sign make any sense to you? "it is a place where 5 meal taste is delighted"? It's no wonder there have been wars. They were understandably caused by blatant misunderstandings! Keeping up with the Akhbars - "Well the Akhbars next door got a bay window. I want a bay window!" Quite a cool little side street in an Istanbul suburb. I feel for this restaurant owner. My liver is pretty unhappy with me some days, too. I love the French translation, as well. One of the countless side streets off of Istiklal Street. They are full of restaurants, cafes and bars, and make for great people watching any time of day or night. The Turkish people are passionate about life which is reflected in the lively conversations being had at any given table. Ah the exuberance of youth! The same day as the May 1 demonstrations, students flooded the side streets preaching their mantra of Anarchy. As far as I could tell, their definition of Anarchy was "let's all sit around and get drunk", which is pretty well the mantra of every student, is it not? I haven't mentioned much about Turkish food, which is diverse, spicy and often beautifully presented. 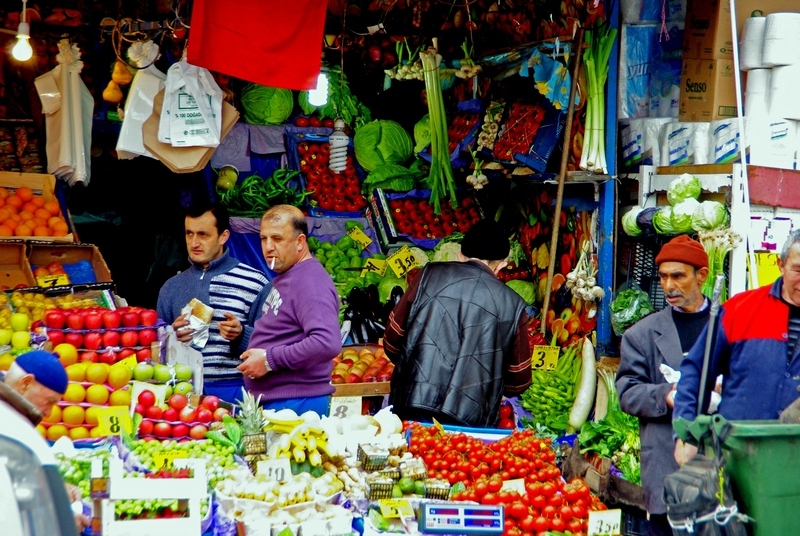 Istanbul is a foodie's delight (as long as you aren't a vegetarian), and deserves a separate post of its own. I came across one notable Turkish favorite, however, while strolling through the neighbourhood of Ortaköy on a Sunday afternoon. It serves as a fitting end to my week in Istanbul. 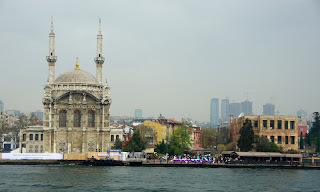 Ortaköy is located along the Bosphorus a few kilometres north of the Dolmabahce Palace. It is a charming little neighbourhood with a long board-walk, colourful apartments and plenty of places to eat and drink. 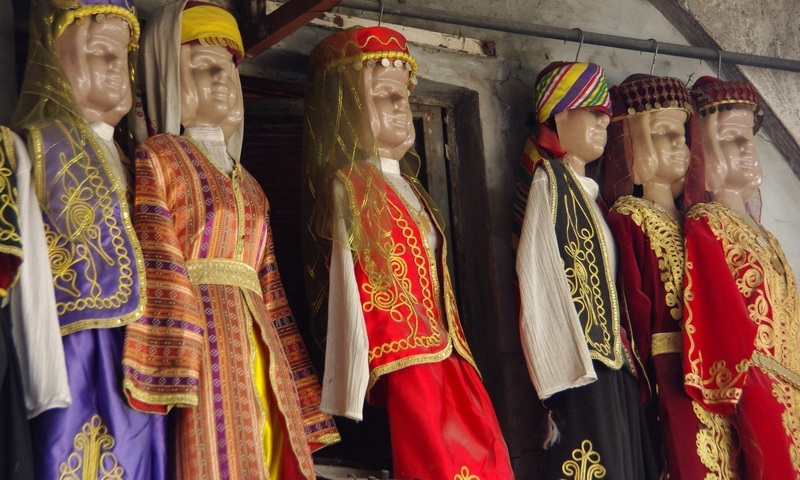 It is the destination in Istanbul for yuppies looking to see and be seen. As I found out, it is also the most likely location in Istanbul for a heart attack. May I introduce to you - Kumpir. Kumpir - a heart attack in every potato! 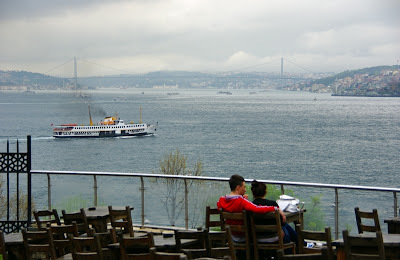 Despite the abundance of restaurants and food options in Ortaköy, everyone is there to eat Kumpir. There are rows upon rows of Kumpir stands, all selling exactly the same thing - a baked potato stuffed to overflowing with a wide assortment of goodies, each specifically designed to clog one of your arteries. The process is quite simple. First you pick your favourite Kumpir vendor, then you start pointing to the myriad selection of toppings located in bins under glass. Next, you stand back as they heap your choices all over a baked potato. They finish it off by covering the whole thing with a few litres of mayonnaise and ketchup. I couldn't decide which toppings looked best so I just asked for some of everything. My vendor raised an eyebrow, shook his head and started piling. I can't believe I ate the whole thing. Unbelievably delicious! Now that is a happy Kumpir customer!